A strange thing started happening to me about two years ago. I would be at a social event, probably a user’s group, and someone would start talking about either their startup idea, or, perhaps, the idea of startup ideas — specifically, The Lean Startup. The next steps were usually consistent: The person would describe the lean startup with superlatives (“awesome” and “amazing” are common), would find out I had not read the book, then refuse to actually explain it (“it’s too much, you must read the book”). Toward the end of the conversation, they would find out that I had my own business and assume that I had not read the book and must be doing it wrong. After a couple of years of this I went out and bought the book. And yes, for what it’s worth, there is plenty of good stuff. I do think I can explain it in the course of a conversation — at least in enough depth to recognize how it is different than other approaches. Early in the book Eric Reis, the author, defines the term startup as a “human institution design to create a new product or service under conditions of extreme uncertainty.” The two key terms here are new and uncertainty. The rest of book makes clear that new might be an understatement; the product is not really defined, much less built. Meanwhile the conditions of uncertainty mean you don’t know if the customers would buy the product if you made it. That means the first thing you need to do is figure out if you are on the right track. The Lean Startup term for this is “customer validation mode”; you want to make sure that if you build it, they will come. Now you might actually build the product, in which case you are going to build a Minimum Viable Product, or MVP. It’s more likely that you create an experiment to figure out if customers will buy. If your product is something people will immediately understand, you might purchase a hundred dollars of Google AdWords for the product and a price point, so see how many people will click through. If lots of people click through, you’ll use that $100 pretty quick, but the answer only cost you a hundred bucks. If they don’t, you didn’t waste any time building a product no one will buy — at least, you know they won’t buy it online at that price point. You conduct the experiment to get data, and get the data in order to make a better decision. The Lean Startup term for this is “validated learning”, where you test your vision for the company. If it fails, you can pivot, or change direction. That’s the heart of the lean startup concept. There are some other details worth mentioning, even in a nutshell post, but first you need to hear about Eric Reis. Eventually, he started listening to his customers, changed the product the IMVU was offering (the “pivot”) and started validating every business assumption like mad. One big piece they did was A/B split work, finding what marketing and sales tactics worked (cheaply) before purchasing a large block of ads or building a product. For example, they might try the Google AdWords trick with two different features; clicking through might do as little as bring you to a “coming soon” page. Whatever gets the most clicks get built, and if all the results are poor, eventually, the company considers a pivot. 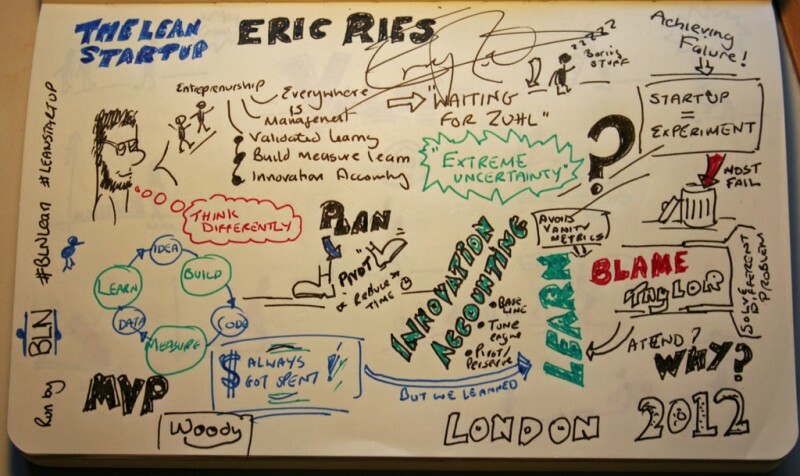 The heart of the lean startup is the Build -> Measure -> Learn -> Build Again loop, in the bottom left of the image. Reis suggests minimizing time through the loop. That means focusing on getting one thing done at a time, instead of batching features up into a set and releasing a big set every, say, nine months. To make sure that happens, Ries favors limiting work in progress — you can’t go analyzing a new feature until the previous feature gets to done-done; that speeds up the loop. It is these ideas that make the lean part of the lean startup, and they are similar to lean concepts in manufacturing. Another big piece of the lean startup is that Minimum Viable Product, or MVP. The purpose of the MVP is not to “sell the smallest thing we can make money on”, but to develop something even smaller. The goal with an MVP isn’t to make money, it is to validate the market, to learn what you could build that customers would actually pay money for. This means you might give away the MVP, or call it a free beta, or even pay people to sit down for an hour to use it, to give you feedback to build the real product. This is a radically different approach than operating in ‘stealth mode’ or ‘radio silence’ in order to develop the perfect product then sell it. After finishing the book, I still don’t know what people mean by “doing” lean startups. My take on the book was more of a reminder to conduct experiments, to validate your work, to defer decisions. W. Edwards Deming called that “Plan->Do->Check->Act.” Reis does add some interesting wrinkles, on how to measure the value of your experiments, and how to learn from experiments, to adjust your plan. It would be impossible to cover the entire book in one post, but I did try to cover the main themes. At this point, if you are interested, you might consider getting the book yourself. 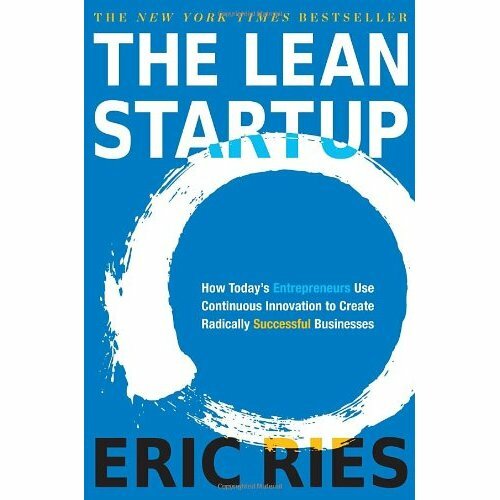 Then again, if you have read the book, I’m sure you can tell me the critical piece that I’m leaving out, or perhaps explain what it means to be “doing” The Lean Startup. Please, tell me how I’m doing it wrong. It’s okay. You’ll actually help the readers, and at this point, for me, it’s basically a hobby. We use the Lean Startup extensively at my place of work. To give you an example of how lean we are encouraged to be, let me tell you about the class/project kickoff. We spend some time describing our idea, then identify the key assumptions that we are making about the idea. The assumptions (or hypotheses) must be true in order for our idea to be successful. Once we narrow down on the most important hypothesis, we have to test it with real (potential) customers. Real meaning real live people. We build/code just enough to actually test the hypothesis, expose it to customers, analyze the data, and formulate insights from the test results. All of this code->test->analyze->insights cycle happens in 2-hours. That is what is meant by doing lean. For example, we might build a landing page for a feature (but not actually build the feature). The landing page would have button called "buy now" or "install". Then, put out an ad to point people to landing page. We are testing how many people actually click the "buy now" button. If no one clicks through, its not worth even building an alpha of the feature. More generally, "Lean" means focusing on the tasks that create value. In a Lean industry (Toyota), creating value is designing and building cars. In a Lean Startup, creating value is learning from your customers and failure. In fact, it's more about "Running Lean Statups" than "Doing Lean Startup": managing your startup in a very productive way, even if you're navigating into disruptive innovation. - They found their market fit. Maybe not in a fully optimized (Lean) way, but they found it. I've been pondering the whole lean startup thing since the book came out. Thinking hard how 'software testing' relates to it all. I came/made up the term 'hypothesis driven testing' and wrote about it here - http://www.testninjas.com/2013/04/hypothesis-driven-testing-testing-in-startups-and-very-small-teams/ Maybe it is useful!